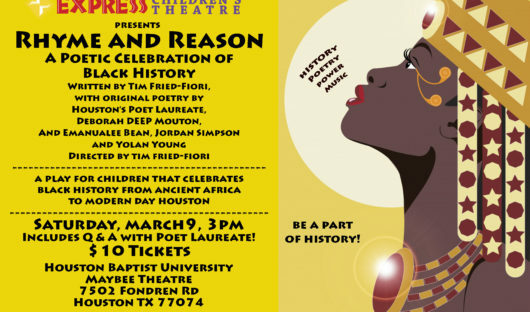 RHYME AND REASON: A POETIC CELEBRATION OF BLACK HISTORY Touring February 5 - March 30th, 2019 Public Show March 9th at 3pm and Q&A with Poet Laureate! Written in collaboration with Houston's Poet Laureate, Deborah DEEP Mouton, and members of the Houston VIP Slam Poets! From Ancient Africa to Modern Day Houston, we celebrate pivotal people and events in Black History. A dynamic presentation of poetry, music and movement that teaches language skills, geography, history and the glory of self-expression. Be the first to know about new productions, workshops and more.